Pu'uhonaua o Honaunau National Historic Park  is a United States National Park on the Big Island in the state of Hawaii in the United States of America. The Hawaii of old was an organized into a social structure including chiefs, priests, skilled laborers and commoners. Strict laws or "kapu" existed for each of the separate divisions. Death was the penalty for breaking the law. One's only option for survival was to elude your pursuers and reach the nearest puuhonua, or place of refuge. 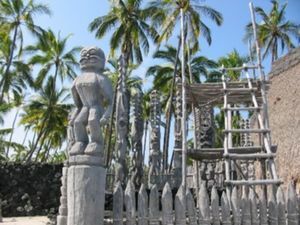 The Royal Grounds adjacent to the pu'uhonua were a favored residence of Hawaiian chiefs. Hale-o-Keawe acted as the royal mausoleum and held the remains of 23 chiefs. It was surrounded by carved wooden images(ki'i) of the gods.The mana (spiritual power) of the remains bestowed sanctity upon this sacred area. This temple was constructed in honor of Keawe'ikekahiali'i o kamoku, the great-grandfather of Kamehameha I. The fragrant pua maia with its flowers of white is a native species. It used for medicine and to help set broken bones. Growing along the lava, you may spot the lavender pohuehue, a native beach morning glory. Walk under the shade of the hala tree, whose leaves are used to weave mats and baskets. Unfortunately, many plants found in the park are invading the native ecosystem, choking out the native vegetation and damaging archeological sites. In recent years non-native red mangrove has aggressively invaded many shoreline habitats in Hawai'i. Beginning in the mid-70s, red mangrove overran both Kaloko and Aimamkapa Ponds. Shortly after the park acquired the lands the park staff aggressively removed the mangrove. This was a huge undertaking and the park's example has now been widely copied on the other islands in Hawai'i. Red mangrove has been entirely removed from the park - but the management staff constantly monitors and removes all new seedlings of this invasive weed. The weather in the park is typically hot and sunny. Plan for daytime temperatures in the upper 80's with cooler temperatures in the evening. Check with the visitor center or your hotel for any weather advisories or hazardous conditions on the day of your visit. 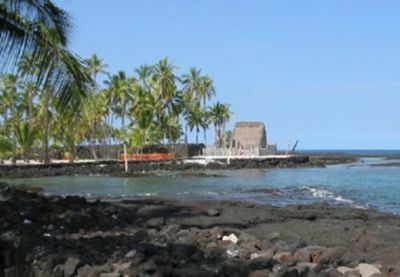 The Puuhonua Translated "Place of Refuge" this area was sanctuary from death sentences. A great wall marks the boundaries between the royal grounds and the sanctuary. Many ki'i (carved wooden images) surround the Hale o Keawe, housing the bones of the chiefs that infuse the area with their power or mana. If you reached this sacred place, you were saved. The Royal Grounds In the past, chiefs entered the royal grounds from Keone'ele Cove by canoe. The pu (conch shell) was sounded to warn of their coming, for it was forbidden for others to look upon or even cast their shadow on the ali'i (chiefs). As the canoe landed, other members of the royal court stroll past the royal fishponds, looking for a choice fish for dinner. Other chiefs engaged in a game of konane. The beauty, splendor and history of the royal grounds at Pu'uhonua o Honuanua are still felt. Take a self-guided walking tour along the trails once reserved for Hawaiian royalty. Ki'ilae Village offers a glimpse into the past, when Hawaii was changing rapidly but still supported traditional aspects of daily life. With the arrival of Europeans in the Hawaiian Islands, many things changed. New plants and animals were introduced and settlements began moving away from the coastal villages to the more fertile uplands and larger harbor cities. What remains in Kiilae today are abandoned heiau (temples), agricultural features and holua slides where the chiefs once rode narrow sleds at great speeds down steep slopes. Animal pens, salt vats and church foundations can be seen from more recent times. Cultural demonstrations Watch demonstrators practice traditional techniques, weave baskets from lauhala, make lei, carve a dugout canoe, or play Hawaiian games. These are just a few of the activities performed by cultural demonstrators in the park. Tidepools The lava outcrops extending into the sea contain many pools of different depths and sizes that form habitats for a variety of marine organisms. In the tidepools you may find sea cucumbers, hermit crabs and various kinds of seaweed. These protected pools also serve as important nursery grounds for young reef fish. Remember to exercise caution when exploring, rocks can be wet and slippery and large waves may appear at anytime. Hiking A 2 mile (round trip) backcountry hike along the 1871 trail through the agricultural areas that surround the park. Along the trail are Hawaiian temples, holua sled courses and the dramatic Keanae'e cliffs. This ancient trail existed long before Europeans arrived in Hawaii and originally connected coastal villages along the South Kona Coast. In the 1800s the trail was widened for travel in horse-drawn carriages. No lodging is available in the park and camping is not permitted. Several bed & breakfasts are located within Honaunau and neighboring towns. Hotels are available in Kailua-Kona, approximately one-half hour from the park. This page was last edited on 12 April 2011, at 20:44.